As discussed last year in Next City, while Chinatowns across the country are shrinking and disappearing due to gentrification and changing settlement patterns, Chicago’s Chinatown has bucked the trend by continuing to grow and thrive. However, community leaders are cautioning that this current success shouldn’t be taken for granted. Our city is currently seeing a development boom, especially around CTA stations like the Cermak-Chinatown stop, and the vacant land north of the neighborhood on the east side of the Chicago River is slated for redevelopment. As such, it’s possible that Chinatown could see rising property values, property taxes, and rents, as well as interest in building the kind of upscale transit-oriented development that has been blamed for fueling displacement of longtime residents in neighborhoods like Logan Square. Chinatown leaders are arguing that for their community to remain affordable and maintain its identity in this hot real estate market, existing residents will have to be proactive about developing a vision for the kind of neighborhood they want to see in the future, and advocating to make it a reality. 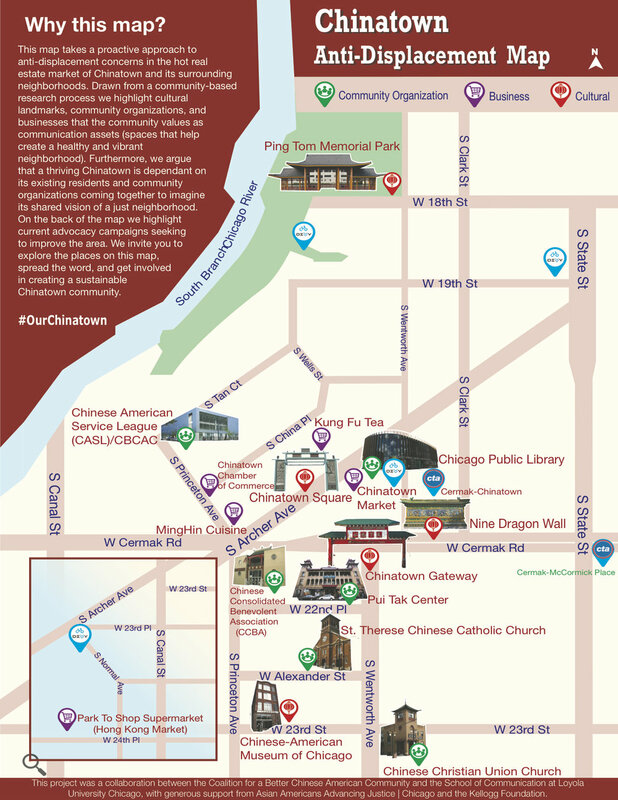 As part of that movement, the Coalition for a Better Chinese American Community and students from Loyola’s School of Communications have developed the Chinatown Anti-Displacement Map. It highlights the locations of cultural landmarks, community organizations, and businesses that community members have identified as “communications assets” that promote social cohesion. It also features the locations of transportation resources like CTA stops and Divvy stations. The Chinatown Anti-Displacement Map. Click to enlarge. The map was published to compliment the Chinatown Community Vision Plan, which included input taken during group discussions with residents of all ages, as well as local community organizations and media outlets. The Chicago Metropolitan Agency for Planning and local alderman Daniel Solis’ office worked with CBCAC to produce the plan. As part of the input process, participants were asked about what they value in Chinatown, what challenges are arising from recent neighborhood changes, and what actions could take place to create a sustainable community. 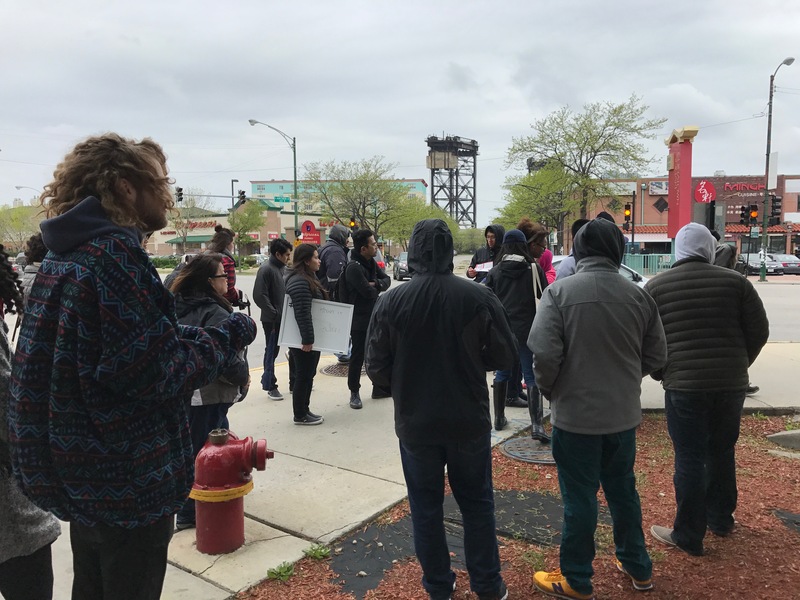 Local transportation safety issues were highlighted on a walking tour of the neighborhood held last Saturday to celebrate the release of the anti-displacement map, led by CBCAC staff, plus Loyola and Whitney Young High School students. “Other Chinatowns wish they started [anti-displacement] advocacy efforts ahead of time,” noted Debbie Liu, the coalition’s community development coordinator. Along with visiting landmarks like the Chinatown Gate (adorned with characters that translate to “The world belongs to the commonwealth), and community resources like the Pui Tak Center and the Chinese American Service League, the tour discussed local transportation projects and issues. At Cermak and Wentworth, where a truck driver fatally struck Augustin Arroyo, 56, last March, architect Ernie Wong discussed the upcoming project to straighten the jog in the intersection, which will improve pedestrian safety and access. Wong works for Site Design Group, which has done many projects in this part of town, including the Chinatown streetscape, Ping Tom Park (including its new boathouse), the Chinatown Library, and Palmisano Park in Bridgeport. Wong said that the Cermak/Wentworth project, which required razing a building at the northwest corner of the intersection won’t just reduce traffic conflicts, but it will also encourage more foot traffic on Chinatown’s older retail strip on Wentworth. “This is going to enrich the neighborhood tremendously,” he said. At the wide six-way intersection of Cermak, Princeton, and Archer, one of the students noted that many kids and seniors need to navigate the dangerous crossing, which sees plenty of truck traffic. However, it’s one of the few junctions in the neighborhood that has been left relatively untouched. CBCAC is working with the Chicago Department of Transportation to identify how the intersection can be redesigned to make it safer and easier to cross. The student also noted that the coalition worked with the CTA and Bridgeport alderman Patrick Daley Thompson to launch a pilot of restored bus service on 31st Street. It’s good to see that, as Chinatown community members are advocating for a vision of a just neighborhood, they view creating safer streets and better transportation access, which will make the neighborhood more livable for existing residents of all ages and income levels, as an important piece of the puzzle.